Spriggite: Mineral information, data and localities. Named in honor of Reginald Claude Sprigg (1 March 1919, Yorketown, South Australia, Australia - 2 December 1994, Glasgow, Scotland), government geologist in South Australia, and conservationalist. He discovered the Pre-Cambrian fossils at Ediacara Hills and is co-author of "Uranium deposits of South Australia". He also founded the popular Arkaroola Wilderness Sanctuary. Sheets in the structure are similar to those in ianthinite, rameauite, and wyartite. Uranophane-β 1 photo of Spriggite associated with Uranophane-β on mindat.org. 4.GC.05 Clarkeite (Na,Ca,Pb)(UO2)O(OH) · 0-1H2O Trig. 4.GC.10 Umohoite (UO2)MoO4 · 2H2O Tric. Brugger, J. et al. (2003), Australian Journal of Mineralogy: 9(1): 15-31. Grice, J.D., Ferraris, G. (2003) New minerals approved in 2002 and nomenclature modifications approved in 1998-2002 by the Commission on the New Minerals and Mineral Names, International Mineralogical Association. The Canadian Mineralogist: 41: 795-802. Grice, J.D., Ferraris, G. (2003) New minerals approved in 2002 and nomenclature modifications approved 1998-2002 by the commission on new minerals and mineral names, International Mineralogical Association. American Mineralogist: 88: 1620-1624. 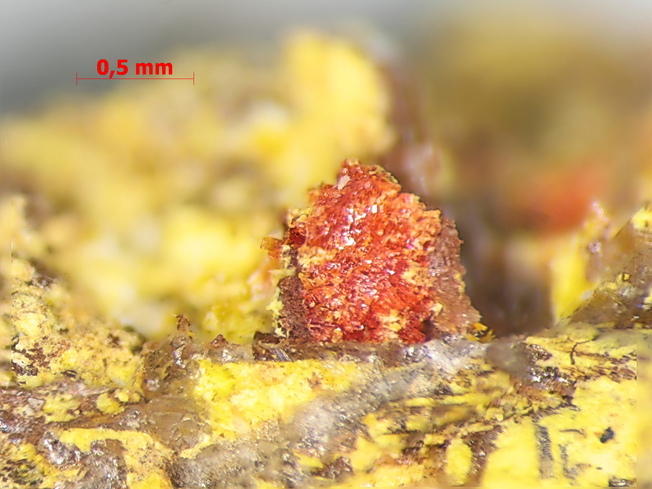 Brugger J., Krivovichev, S.V., Berlepsch, P., Meisser, N., Ansermet, S., Armbruster, T. (2004) Spriggite, Pb3[(UO2)6O8(OH)2](H2O)3, a new mineral with β-U3O8-type sheets: description and crystal structure. American Mineralogist: 89: 339-347. Mandarino, J.A. (2004) New minerals. The Canadian Mineralogist: 42: 1241-1260. J. Brugger at al. : Australian Journal of Mineralogy 9(1):15-31 (2003); J. Brugger et al. : Amer. Min. 89:339-347 (2004); Lapis 29(3):41 (2004); Brugger, J., Meisser, N., Etschmann, B., Ansermet, S., & Pring, A. (2011). Paulscherrerite from the Number 2 Workings, Mount Painter Inlier, Northern Flinders Ranges, South Australia:“Dehydrated schoepite” is a mineral after all. American Mineralogist, 96(2-3), 229-240.